Dr. Guffin is a native of Gardendale, Alabama, and graduate of Samford University. As a college student in 1985, he became the youth minister in a local church, launching a thirty-two year ministry career that would see him serving in a variety of churches in Alabama, Kentucky and Indiana. During his time in local church ministry, Dr. Guffin served as a youth minister, minister of music, associate pastor and senior pastor. Dr. Guffin’s greatest passions when serving in local church ministry were preaching, teaching, disciplemaking and missions. A veteran of various types of missions projects at home and abroad, his desire as a minister was always to motivate and equip Christians to get engaged in disciple-making missions as well. 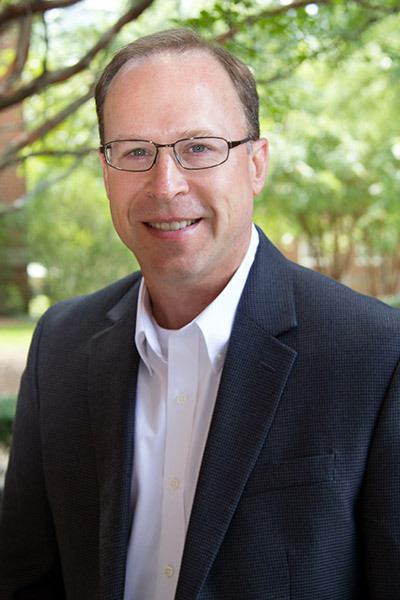 In 2017, Dr. Guffin joined Samford’s faculty as the Executive Director of Christian Ministry, tasked with the development of the Christian Ministry degree program. His passion for disciplemaking and missions has greatly influenced the direction of the program, and his greatest desire at Samford is to inspire and prepare students for lifelong engagement in ministry and missions—in the local church and around the world. Dr. Guffin holds a B. A. from Samford University, and a M. Div. and Ph.D. from the Southern Baptist Theological Seminary in Louisville, Kentucky. He has been married to Beth Bush Guffin since 1989, and they have two grown children—Blake and Bailey. In his spare time, he enjoys college football and being outdoors.